Check out these crafty blogs! Yay! I got my nametags yesterday! I ordered them from R. Draper & Co. in Australia. They're fully woven. I'm really happy with the quality. And the price was good, just US$24 for 50 labels. Now I need to finish something so that I can put on a nametag. I'm finally back from work travel and then two days vacation in Phoenix (where it was 110F, ouch). It's good to be home. I have a lot of blogs to catch up on! ...but I'm going to try posting again that I'll be gone next week, so there will be no new posts. The last time I posted this, just last week, things went bad and we had to cancel our vacation. This next trip is a business trip in S. CA, 14-hour work days, yay! I had this one planned before, but now I have to travel only from AZ to CA, instead of the cross-country (MA-CA) jaunt I previously had booked. So, "see" you all in a week. I hope. And that would be...because it's not. We had to cancel our trip back east because Max had a "reactive airways" (asthma) episode that landed us in the emergency room on Sunday. We finally got out Monday, late afternoon. He's doing so much better now. He always recovers quickly and well from an asthma attack, a fact for which we're extremely grateful. So we're not going to Boston right now. There are four disappointed (but understanding) grandparents back east. And one disappointed toddler out west. Plus two exhausted and stressed parents. One thing before the pictures: a note for families with small children. If you don't already use Southwest Airlines, I definitely suggest checking them out. The no-assigned-seating thing was annoying when I was childless, but since we now travel with child it's much easier. Families travelling with children under age 5 (I think it's 5) get to board early so you can be certain that you'll get seats together. And also you don't need to wait in all the lines that form at the Southwest counters (to get your priority number, to get in line within your priority class). You just sit in the boarding area, get your boarding pass/priority number whenever the line goes down, and then when they call families you just get on board. OK, time for pictures. Max was feeling so much better on Monday that I went home to deal with travel issues (and grab the camera) while Steve stayed with Max at the hospital. 1. Birdie Monkey and Farmer Pig talk about life at the hospital. Max got Farmer Pig at the ER. 2. Playtime in the room, removing solid rocket boosters from his space shuttle. 3. Lining up the rockets on the table. 4. In the playroom, peeking out the house window. 5. A bigger view of the really neat house. 6. "Eating" apples off the tree. 7. Taking nurse Charlie for a walk. 8. Fun artwork by Mackenzie Thorpe decorated the pediatrics ward. 9. Back at home, Birdie Monkey demonstrates alternative use of the oxygen mask. One last craft-related post before I leave for Boston. 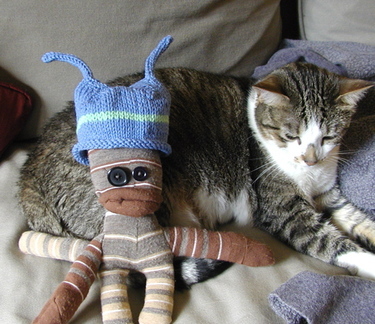 Birdie-monkey's new hat. (And Gurley, for visual interest.) The hat has a dual-pointed top, to accomodate his ears. Max requested that I sit with him while watching the Jonah VeggieTales movie, so I pulled this out to work on while we watched. Socks, mittens, and tail warmer coming soon. On another note, the heffalump sock elephant isn't working out so well. Maybe I'll try it again when we return. I think that socks are just too skinny for elephants. I'll need to do some grafting I think. See y'all in 2 weeks (or earlier, if I can manage it)! In other news, the new round of back-tack has been announced. Although they originally said that signups would start on 17 August, that's been changed and they're going on now. So go sign up if you want to play! First 100 people will be in. Well, I don't have an iPod. Actually, I hardly listen to music anymore. Mostly NPR. How depressing is that? So instead I went out to my car to find out what was in the CD player. I pretty much don't listen to these either, but this is the closest I could come to answering this one. It's a 6-CD changer in the car, so I'm just putting down all 6. 1. I got to have a really nice lunch with my hubby on Wednesday. Just us. 2. Except for this week, I've been getting to do a lot of crafting, which makes me happy. 3. I've been having nice "artist" lunches with my friend JoAnne, and we've had some really interesting, insightful, and useful conversations. 4. Max giving me a kiss on the cheek, patting my back, and asking "are you happy mommy?" 5. Lately I've been re-discovering our cats, all 4 of them. We used to pay so much attention to the kitties in the pre-Max days, but they've been ignored since he arrived. But they're actually really nice, sweet cats. I'm glad I'm paying more attention to them again. I'd really like to add "going on vacation to visit both sets of grandparents" to this list, but right now I'm just too stressed about travelling. 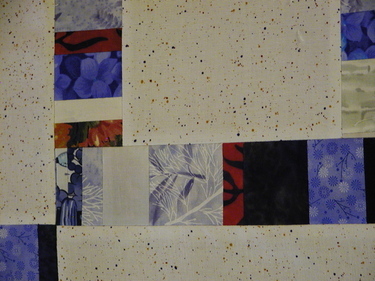 Modern Quilt-Along update: Here's the top of my table runner, and a close-up of a section. 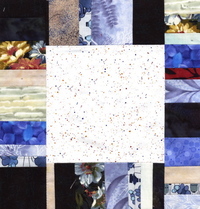 It has 7 frame pieces plus 6 reverse frame pieces. Once I got all the little strips sewed together and then cut up, it became very easy to put it all together. I didn't have to stress about the color combinations anymore. It doesn't really matter what goes next to what, it all looks good. I like how this turned out. I don't know if this carries in the photo, but if you kinda squint a little when looking at it, I think it looks a little like a film or picture montage. Like if you looked closely at all the little squares, they might be full-size pictures. 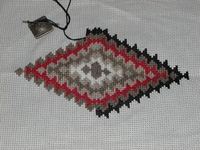 After laying it out like this, I realized how light-colored it is. 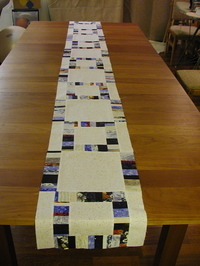 Was this a good idea for a table runner? Probably not, but it's too late now. Progress from here on won't be as quick. I now have to teach myself how to do free-motion quilting with my machine, as I've never done that before. First, I'm going to try closely-spaced straight diagonal lines on a sample block, but I think that stipple quilting will look better. And I'm going on vacation/business travel in a week. So I probably won't get around to finishing this until September. Darn. One more thing: here's a slightly early "happy birthday" to Stephen, my wonderful husband. He turns 40 tomorrow! Here are the cakes he made to take to the office today. Yum! A lemon cake with lemon curd roll, and a chocolate with espresso cream roll. He made them all by himself (except the lemon curd, which was give to us by friends), he's quite a good baker. The tradition at his office is for someone to bring in desserts on their birthday. Talk about a roller coaster of opinion. Coming back from the fabric store, I loved my fabric. As I was cutting strips, I was sure this was going to be the ugliest color combination ever conceived. After they were pieced together, I felt better about them. When they were finally attached to the center square, I liked them again. There was considerable discussion at home about one of my fabric choices, the blue lanterns (see here, at the bottom of the post, little square at the top right). In the end, the pattern stood out too much, so I sewed a seam down the middle of my wider pieces to break up the pattern. I think this worked well. Here's a representative block. The scanner wasn't quite wide enough, so some on the right got cut off. And the scanner made the darks much darker, so they all look black. In reality, they have some patterning. This was pretty easy. It was fun making all the stripey pieces, mixing up the components to get semi-random arrangements. I can't wait to piece everything together and see how it looks. The quickie look on the dining table last night was promising!